These Chickpea Crêpes are vegan, and suitable for all sorts of meals. This month we were challenged to make pathiri, which are rice flour pancakes traditionally eaten during Ramadan. I am sure I must have tasted them when I was in Dubai over Ramadan, but I cannot remember that far back ;). I have a lot of gluten free flour in my house but I do not have any rice flour, and so I could not make traditional pathiri. However the mandatory item was to make a crepe of your choosing, representing your inner creativity or based on your experience that interests you and add any “simple” condiments to complement your style, your culture or flavours you chose. I decided that the best thing for me to do was to create a crêpe recipe using the ingredients I had to hand, being chickpea flour and coconut milk. I also wanted to create a vegan dish and so did not use eggs for this chickpea crêpe recipe. Despite being a little worried that the batter would be too thick, I went ahead and made them. And the Chickpea Crêpes were perfect. I made small crêpes to eat with savoury mince and I served them in the manner they would be traditionally served at a Muslim table, with no cutlery. 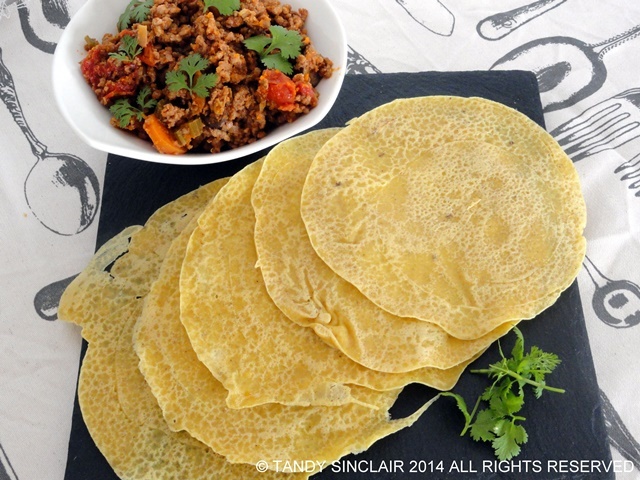 You use the crêpe to gather the mince and the combination of flavours made for a very delicious Sunday supper. Great recipe for something that I can always use in the kitchen! Wow Tandy, I love this…I have never used chickpea flour, now that seeing this crepes I will sure look for it and try this recipe…and yes, the coconut in the batter must make this crepes taste even better…yum! Not only do I love the look of these crepes, but the chickpea flour shows great ingenuity! I’d definitely love to try this one day! I love crepes, and these sound really very good, Tandy. Please let me know how it works with the rice flour! What a creative idea for chickpeas! They look very nice. I made the effort to buy some rice flour but unfortunately didn’t manage to make the pathiri in time! Lovely – I’ve made socca but not this version – am dying to try now! I have to go and see what socca are! Hi Tandy your crepes sound amazing, a little like socca. When you talk about serving this with a savory mince, what exactly it that? Very nice and unique, Tandy! Your crepes look wonderfully thin…I’m sure they were as delicious as they look. Fabulous – I have chickpea flour in the cupboard.